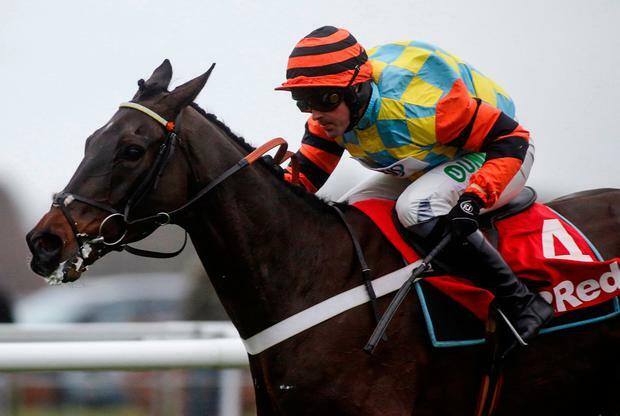 Might Bite lived up to his lofty reputation from his novice days to land the 32Red King George VI Chase at Kempton. The Nicky Henderson-trained eight-year-old made amends for falling in the Kauto Star Novices' Chase at this meeting 12 months ago - but it was hard work once the pack closed in. Bristol De Mai made most of the running but always had Might Bite for company and Nico de Boinville decided to let him go on from the fourth-last fence after the long-time leader looked to be struggling. Might Bite (6-4 favourite) had to stave off several challenges in the straight but never looked like being caught as he held Double Shuffle (50-1) by a length, with Tea For Two (20-1) another two lengths away third. Last year's winner Thistlecrack was fourth. De Boinville said: "He was fantastic. On a horse that jumps as well as him you can't keep taking him back. "Bristol De Mai was just making a few mistakes and I was jumping into the lead, so instead of taking a pull I let him go and enjoy it. "He's given me a great spin and I couldn't be more delighted for the team. Some of them had five lots this morning so it's tough, but it's paid off at the end. "He jumped the last as if he had plenty left and I think he was just idling slightly. If something had come at him I think he'd have gone again. "He's a delightful horse. I was a bit worried about the ground, having ridden on it earlier, but this was great. "I must thank the guvnor and the owners for letting me ride him." Henderson said: "He was great, wasn't he? "He jumped beautifully all the way and he enjoys doing that - he's so exuberant. "He has so much presence and charisma. You can't help but love him as he's gorgeous. "He loves to show off, and that's what he was doing most of the way."